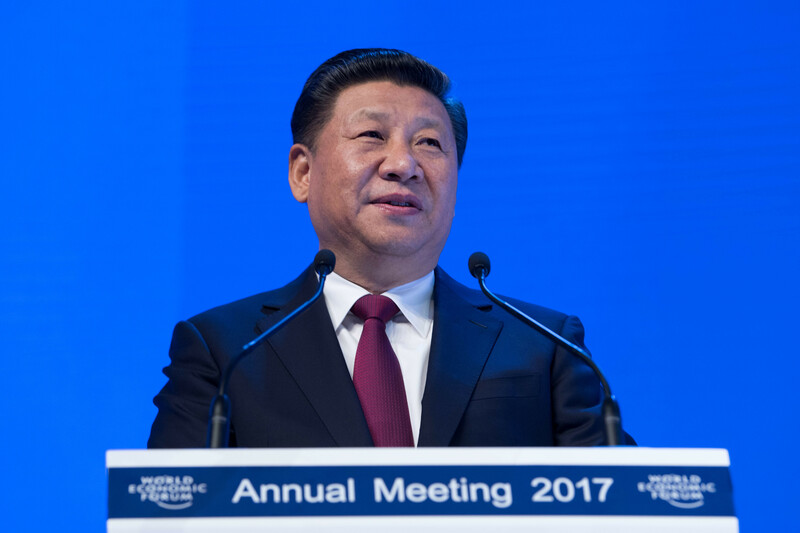 Xi Jinping delivered the opening plenary at Davos 2017. I’m delighted to come to beautiful Davos. Though just a small town in the Alps, Davos is an important window for taking the pulse of the global economy. People from around the world come here to exchange ideas and insights, which broaden their vision. This makes the WEF annual meeting a cost-effective brainstorming event, which I would call “Schwab economics”. “It was the best of times, it was the worst of times.” These are the words used by the English writer Charles Dickens to describe the world after the Industrial Revolution. Today, we also live in a world of contradictions. On the one hand, with growing material wealth and advances in science and technology, human civilization has developed as never before. On the other hand, frequent regional conflicts, global challenges like terrorism and refugees, as well as poverty, unemployment and widening income gap have all added to the uncertainties of the world. Many people feel bewildered and wonder: What has gone wrong with the world? To answer this question, one must first track the source of the problem. Some blame economic globalization for the chaos in the world. Economic globalization was once viewed as the treasure cave found by Ali Baba in The Arabian Nights, but it has now become the Pandora’s box in the eyes of many. The international community finds itself in a heated debate on economic globalization. Today, I wish to address the global economy in the context of economic globalization. The point I want to make is that many of the problems troubling the world are not caused by economic globalization. For instance, the refugee waves from the Middle East and North Africa in recent years have become a global concern. Several million people have been displaced, and some small children lost their lives while crossing the rough sea. This is indeed heartbreaking. It is war, conflict and regional turbulence that have created this problem, and its solution lies in making peace, promoting reconciliation and restoring stability. The international financial crisis is another example. It is not an inevitable outcome of economic globalization; rather, it is the consequence of excessive chase of profit by financial capital and grave failure of financial regulation. Just blaming economic globalization for the world’s problems is inconsistent with reality, and it will not help solve the problems. From the historical perspective, economic globalization resulted from growing social productivity, and is a natural outcome of scientific and technological progress, not something created by any individuals or any countries. Economic globalization has powered global growth and facilitated movement of goods and capital, advances in science, technology and civilization, and interactions among peoples. But we should also recognize that economic globalization is a double-edged sword. When the global economy is under downward pressure, it is hard to make the cake of global economy bigger. It may even shrink, which will strain the relations between growth and distribution, between capital and labor, and between efficiency and equity. Both developed and developing countries have felt the punch. Voices against globalization have laid bare pitfalls in the process of economic globalization that we need to take seriously. As a line in an old Chinese poem goes, “Honey melons hang on bitter vines; sweet dates grow on thistles and thorns.” In a philosophical sense, nothing is perfect in the world. One would fail to see the full picture if he claims something is perfect because of its merits, or if he views something as useless just because of its defects. It is true that economic globalization has created new problems, but this is no justification to write economic globalization off completely. Rather, we should adapt to and guide economic globalization, cushion its negative impact, and deliver its benefits to all countries and all nations. There was a time when China also had doubts about economic globalization, and was not sure whether it should join the World Trade Organization. But we came to the conclusion that integration into the global economy is a historical trend. To grow its economy, China must have the courage to swim in the vast ocean of the global market. If one is always afraid of bracing the storm and exploring the new world, he will sooner or later get drowned in the ocean. Therefore, China took a brave step to embrace the global market. We have had our fair share of choking in the water and encountered whirlpools and choppy waves, but we have learned how to swim in this process. It has proved to be a right strategic choice. Whether you like it or not, the global economy is the big ocean that you cannot escape from. Any attempt to cut off the flow of capital, technologies, products, industries and people between economies, and channel the waters in the ocean back into isolated lakes and creeks is simply not possible. Indeed, it runs counter to the historical trend. The history of mankind tells us that problems are not to be feared. What should concern us is refusing to face up to problems and not knowing what to do about them. In the face of both opportunities and challenges of economic globalization, the right thing to do is to seize every opportunity, jointly meet challenges and chart the right course for economic globalization. At the APEC Economic Leaders’ Meeting in late 2016, I spoke about the necessity to make the process of economic globalization more invigorated, more inclusive and more sustainable. We should act pro-actively and manage economic globalization as appropriate so as to release its positive impact and rebalance the process of economic globalization. We should follow the general trend, proceed from our respective national conditions and embark on the right pathway of integrating into economic globalization with the right pace. We should strike a balance between efficiency and equity to ensure that different countries, different social strata and different groups of people all share in the benefits of economic globalization. The people of all countries expect nothing less from us, and this is our unshirkable responsibility as leaders of our times. At present, the most pressing task before us is to steer the global economy out of difficulty. The global economy has remained sluggish for quite some time. The gap between the poor and the rich and between the South and the North is widening. The root cause is that the three critical issues in the economic sphere have not been effectively addressed. First, lack of robust driving forces for global growth makes it difficult to sustain the steady growth of the global economy. The growth of the global economy is now at its slowest pace in seven years. Growth of global trade has been slower than global GDP growth. Short-term policy stimuli are ineffective. Fundamental structural reform is just unfolding. The global economy is now in a period of moving toward new growth drivers, and the role of traditional engines to drive growth has weakened. Despite the emergence of new technologies such as artificial intelligence and 3-D printing, new sources of growth are yet to emerge. A new path for the global economy remains elusive. Second, inadequate global economic governance makes it difficult to adapt to new developments in the global economy. Madame Christine Lagarde recently told me that emerging markets and developing countries already contribute to 80 percent of the growth of the global economy. The global economic landscape has changed profoundly in the past few decades. However, the global governance system has not embraced those new changes and is therefore inadequate in terms of representation and inclusiveness. The global industrial landscape is changing and new industrial chains, value chains and supply chains are taking shape. However, trade and investment rules have not kept pace with these developments, resulting in acute problems such as closed mechanisms and fragmentation of rules. The global financial market needs to be more resilient against risks, but the global financial governance mechanism fails to meet the new requirement and is thus unable to effectively resolve problems such as frequent international financial market volatility and the build-up of asset bubbles. Third, uneven global development makes it difficult to meet people’s expectations for better lives. Dr. Schwab has observed in his book The Fourth Industrial Revolution that this round of industrial revolution will produce extensive and far-reaching impacts such as growing inequality, particularly the possible widening gap between return on capital and return on labor. The richest one percent of the world’s population own more wealth than the remaining 99 percent. Inequality in income distribution and uneven development space are worrying. Over 700 million people in the world are still living in extreme poverty. For many families, to have warm houses, enough food and secure jobs is still a distant dream. This is the biggest challenge facing the world today. It is also what is behind the social turmoil in some countries. All this shows that there are indeed problems with world economic growth, governance and development models, and they must be resolved. The founder of the Red Cross Henry Dunant once said, “Our real enemy is not the neighboring country; it is hunger, poverty, ignorance, superstition and prejudice.” We need to have the vision to dissect these problems; more importantly, we need to have the courage to take actions to address them. First, we should develop a dynamic, innovation-driven growth model. The fundamental issue plaguing the global economy is the lack of driving force for growth.Innovation is the primary force guiding development. Unlike the previous industrial revolutions, the fourth industrial revolution is unfolding at an exponential rather than linear pace. We need to relentlessly pursue innovation. Only with the courage to innovate and reform can we remove bottlenecks blocking global growth and development. With this in mind, G-20 leaders reached an important consensus at the Hangzhou Summit, which is to take innovation as a key driver and foster new driving force of growth for both individual countries and the global economy. We should develop a new development philosophy and rise above the debate about whether there should be more fiscal stimulus or more monetary easing. We should adopt a multipronged approach to address both the symptoms and the underlying problems. We should adopt new policy instruments and advance structural reform to create more space for growth and sustain its momentum. We should develop new growth models and seize opportunities presented by the new round of industrial revolution and digital economy. We should meet the challenges of climate change and aging population. We should address the negative impact of IT application and automation on jobs. When cultivating new industries and new forms models of business models, we should create new jobs and restore confidence and hope to our peoples. Second, we should pursue a well-coordinated and inter-connected approach to develop a model of open and win-win cooperation. Today, mankind has become a close-knit community of shared future. Countries have extensive converging interests and are mutually dependent. All countries enjoy the right to development. At the same time, they should view their own interests in a broader context and refrain from pursuing them at the expense of others. We should commit ourselves to growing an open global economy to share opportunities and interests through opening-up and achieve win-win outcomes. One should not just retreat to the harbor when encountering a storm, for this will never get us to the other shore of the ocean. We must redouble efforts to develop global connectivity to enable all countries to achieve inter-connected growth and share prosperity. We must remain committed to developing global free trade and investment, promote trade and investment liberalization and facilitation through opening-up and say no to protectionism. Pursuing protectionism is like locking oneself in a dark room. While wind and rain may be kept outside, that dark room will also block light and air. No one will emerge as a winner in a trade war. Third, we should develop a model of fair and equitable governance in keeping with the trend of the times. As the Chinese saying goes, people with petty shrewdness attend to trivial matters, while people with vision attend to governance of institutions. There is a growing call from the international community for reforming the global economic governance system, which is a pressing task for us. Only when it adapts to new dynamics in the international economic architecture can the global governance system sustain global growth. Countries, big or small, strong or weak, rich or poor, are all equal members of the international community. As such, they are entitled to participate in decision-making, enjoy rights and fulfill obligations on an equal basis. Emerging markets and developing countries deserve greater representation and voice. The 2010 IMF quota reform has entered into force, and its momentum should be sustained. We should adhere to multilateralism to uphold the authority and efficacy of multilateral institutions. We should honor promises and abide by rules. One should not select or bend rules as he sees fit. The Paris Agreement is a hard-won achievement which is in keeping with the underlying trend of global development. All signatories should stick to it instead of walking away from it as this is a responsibility we must assume for future generations. Fourth, we should develop a balanced, equitable and inclusive development model. As the Chinese saying goes, “A just cause should be pursued for common good.”Development is ultimately for the people. To achieve more balanced development and ensure that the people have equal access to opportunities and share in the benefits of development, it is crucial to have a sound development philosophy and model and make development equitable, effective and balanced. We should foster a culture that values diligence, frugality and enterprise and respects the fruits of hard work of all. Priority should be given to addressing poverty, unemployment, the widening income gap and the concerns of the disadvantaged to promote social equity and justice. It is important to protect the environment while pursuing economic and social progress so as to achieve harmony between man and nature and between man and society. The 2030 Agenda for Sustainable Development should be implemented to realize balanced development across the world. A Chinese adage reads, “Victory is ensured when people pool their strength; success is secured when people put their heads together.” As long as we keep to the goal of building a community of shared future for mankind and work hand in hand to fulfill our responsibilities and overcome difficulties, we will be able to create a better world and deliver better lives for our peoples. China has become the world’s second largest economy thanks to 38 years of reform and opening-up. A right path leads to a bright future. China has come this far because the Chinese people have, under the leadership of the Communist Party of China, blazed a development path that suits China’s actual conditions. This is a path based on China’s realities. China has in the past years succeeded in embarking on a development path that suits itself by drawing on both the wisdom of its civilization and the practices of other countries in both East and West. In exploring this path, China refuses to stay insensitive to the changing times or to blindly follow in others’ footsteps. All roads lead to Rome. No country should view its own development path as the only viable one, still less should it impose its own development path on others. This is a path that puts people’s interests first. China follows a people-oriented development philosophy and is committed to bettering the lives of its people. Development is of the people, by the people and for the people. China pursues the goal of common prosperity. We have taken major steps to alleviate poverty and lifted over 700 million people out of poverty, and good progress is being made in our efforts to finish building a society of initial prosperity in all respects. This is a path of pursuing reform and innovation. China has tackled difficulties and met challenges on its way forward through reform. China has demonstrated its courage to take on difficult issues, navigate treacherous rapids and remove institutional hurdles standing in the way of development. These efforts have enabled us to unleash productivity and social vitality. Building on progress of 30-odd years of reform, we have introduced more than 1,200 reform measures over the past four years, injecting powerful impetus into China’s development. This is a path of pursuing common development through opening-up. China is committed to a fundamental policy of opening-up and pursues a win-win opening-up strategy. China’s development is both domestic and external oriented; while developing itself, China also shares more of its development outcomes with other countries and peoples. China’s outstanding development achievements and the vastly improved living standards of the Chinese people are a blessing to both China and the world. Such achievements in development over the past decades owe themselves to the hard work and perseverance of the Chinese people, a quality that has defined the Chinese nation for several thousand years. We Chinese know only too well that there is no such thing as a free lunch in the world. For a big country with over 1.3 billion people, development can be achieved only with the dedication and tireless efforts of its own people. We cannot expect others to deliver development to China, and no one is in a position to do so. When assessing China’s development, one should not only see what benefits the Chinese people have gained, but also how much hard effort they have put in, not just what achievements China has made, but also what contribution China has made to the world. Then one will reach a balanced conclusion about China’s development. Between 1950 and 2016, despite its modest level of development and living standard, China provided more than 400 billion yuan of foreign assistance, undertook over 5,000 foreign assistance projects, including nearly 3,000 complete projects, and held over 11,000 training workshops in China for over 260,000 personnel from other developing countries. Since it launched reform and opening-up, China has attracted over $1.7 trillion of foreign investment and made over $1.2 trillion of direct outbound investment, making huge contribution to global economic development. In the years following the outbreak of the international financial crisis, China contributed to over 30 percent of global growth every year on average. All these figures are among the highest in the world. The figures speak for themselves. China’s development is an opportunity for the world; China has not only benefited from economic globalization but also contributed to it. Rapid growth in China has been a sustained, powerful engine for global economic stability and expansion. The inter-connected development of China and a large number of other countries has made the world economy more balanced. China’s remarkable achievement in poverty reduction has contributed to more inclusive global growth. And China’s continuous progress in reform and opening-up has lent much momentum to an open world economy. We Chinese know only too well what it takes to achieve prosperity, so we applaud the achievements made by others and wish them a better future. We are not jealous of others’ success; and we will not complain about others who have benefited so much from the great opportunities presented by China’s development. We will open our arms to the people of other countries and welcome them aboard the express train of China’s development. I know you are all closely following China’s economic development, and let me give you an update on the state of China’s economy. China’s economy has entered what we call a new normal, in which major changes are taking place in terms of growth rate, development model, economic structure and drivers of growth. But the economic fundamentals sustaining sound development remain unchanged. Despite a sluggish global economy, China’s economy is expected to grow by 6.7 percent in 2016, still one of the highest in the world. China’s economy is far bigger in size than in the past, and it now generates more output than it did with double-digit growth in the past. Household consumption and the services sector have become the main drivers of growth. In the first three quarters of 2016, added value of the tertiary industry took up 52.8 percent of the GDP and domestic consumption contributed to 71 percent of economic growth. Household income and employment have steadily risen, while per unit GDP energy consumption continues to drop. Our efforts to pursue green development are paying off. The Chinese economy faces downward pressure and many difficulties, including acute mismatch between excess capacity and an upgrading demand structure, lack of internal driving force for growth, accumulation of financial risks, and growing challenges in certain regions. We see these as temporary hardships that occur on the way forward. And the measures we have taken to address these problems are producing good results. We are firm in our resolve to forge ahead. China is the world’s largest developing country with over 1.3 billion people, and their living standards are not yet high. But this reality also means China has enormous potential and space for development. Guided by the vision of innovative, coordinated, green, open and shared development, we will adapt to the new normal, stay ahead of the curve, and make coordinated efforts to maintain steady growth, accelerate reform, adjust economic structure, improve people’s living standards and fend off risks. With these efforts, we aim to achieve medium-high rate of growth and upgrade the economy to higher end of the value chain. — China will strive to enhance the performance of economic growth. We will pursue supply-side structural reform as the general goal, shift the growth model and upgrade the economic structure. We will continue to cut overcapacity, reduce inventory, deleverage financing, reduce cost and strengthen weak links. We will foster new drivers of growth, develop an advanced manufacturing sector and upgrade the real economy. We will implement the Internet Plus action plan to boost effective demand and better meet the individualized and diverse needs of consumers. And we will do more to protect the ecosystem. — China will boost market vitality to add new impetus to growth. We will intensify reform efforts in priority areas and key links and enable the market to play a decisive role in resources allocation. Innovation will continue to feature prominently on our growth agenda. In pursuing the strategy of innovation-driven development, we will bolster the strategic emerging industries, apply new technologies and foster new business models to upgrade traditional industries; and we will boost new drivers of growth and revitalize traditional ones. — China will foster an enabling and orderly environment for investment. We will expand market access for foreign investors, build high-standard pilot free trade zones, strengthen protection of property rights, and level the playing field to make China’s market more transparent and better regulated. In the coming five years, China is expected to import $8 trillion of goods, attract $600 billion of foreign investment and make $750 billion of outbound investment. Chinese tourists will make 700 million overseas visits. All this will create a bigger market, more capital, more products and more business opportunities for other countries. China’s development will continue to offer opportunities to business communities in other countries. China will keep its door wide open and not close it. An open door allows both other countries to access the Chinese market and China itself to integrate with the world. And we hope that other countries will also keep their door open to Chinese investors and keep the playing field level for us. — China will vigorously foster an external environment of opening-up for common development. We will advance the building of the Free Trade Area of the Asia Pacific and negotiations of the Regional Comprehensive Economic Partnership to form a global network of free trade arrangements. 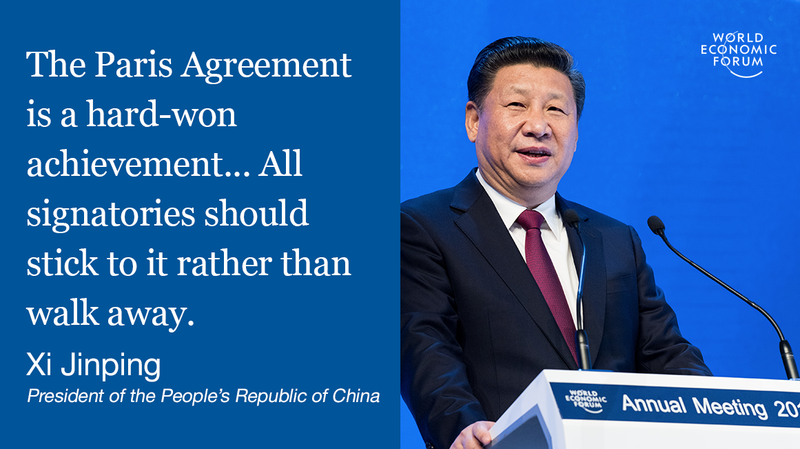 China stands for concluding open, transparent and win-win regional free trade arrangements and opposes forming exclusive groups that are fragmented in nature. China has no intention to boost its trade competitiveness by devaluing the RMB, still less will it launch a currency war. Over three years ago, I put forward the “Belt and Road” initiative. Since then, over 100 countries and international organizations have given warm responses and support to the initiative. More than 40 countries and international organizations have signed cooperation agreements with China, and our circle of friends along the “Belt and Road” is growing bigger. Chinese companies have made over $50 billion of investment and launched a number of major projects in the countries along the routes, spurring the economic development of these countries and creating many local jobs. The “Belt and Road” initiative originated in China, but it has delivered benefits well beyond its borders. In May this year, China will host in Beijing the Belt and Road Forum for International Cooperation, which aims to discuss ways to boost cooperation, build cooperation platforms and share cooperation outcomes. 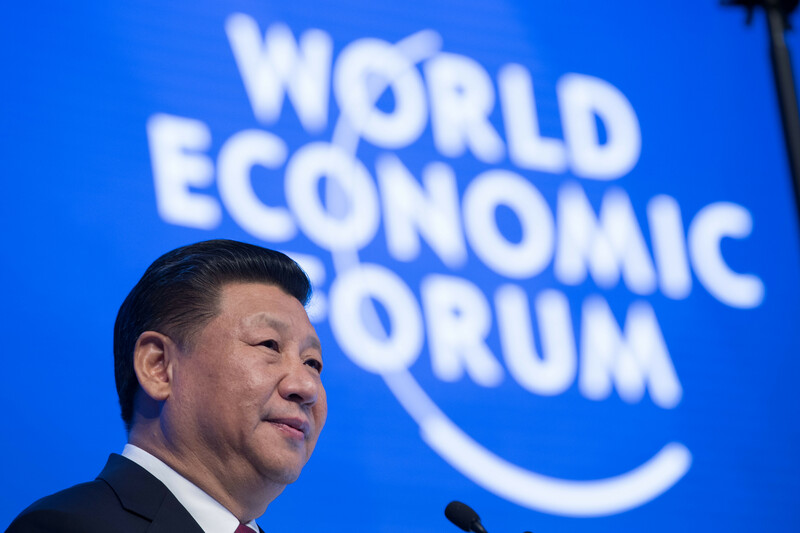 The forum will also explore ways to address problems facing global and regional economy, create fresh energy for pursuing inter-connected development and make the “Belt and Road” initiative deliver greater benefits to people of countries involved. World history shows that the road of human civilization has never been a smooth one, and that mankind has made progress by surmounting difficulties. No difficulty, however daunting, will stop mankind from advancing. When encountering difficulties, we should not complain about ourselves, blame others, lose confidence or run away from responsibilities. We should join hands and rise to the challenge. History is created by the brave. Let us boost confidence, take actions and march arm-in-arm toward a bright future.